Memebox Black Friday Deals Start Now plus Sneak Peek into the VAULT Boxes!! Memebox is starting their Black Friday sales early! Starting now it's the Color Sale. 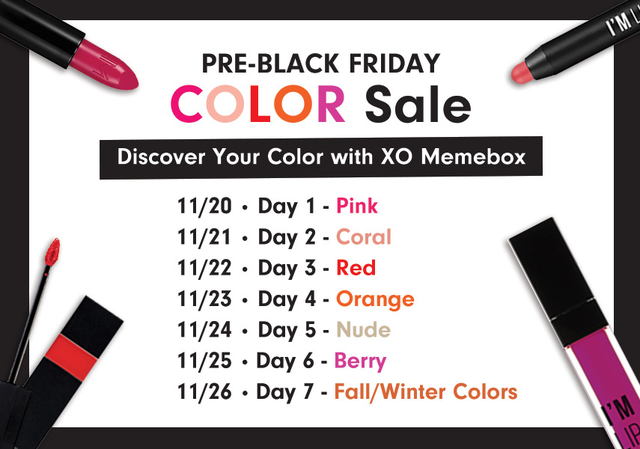 Here's the list of XO Memebox colors and dates they'll be on sale for 30% off. Today it's PINK! You can check out what's available here. More importantly I have DETAILS on the Vault boxes!! Including what you'll find in the Best of Memebox Vault Box for $149!! This is the Skincare and Makeup Vault but there's also a Makeup Only Vault and a Mask Vault with 100 sheet masks in it. So yeah... FUN!! 7 Seconds Sheet Mask- I love these! Elizavecca Carbonated Bubbly Clay Mask- Totally wanting to try this! Su:m 37 Rose Cleansing Stick- I have this on my wishlist! Benton Snail Bee High Content Essence- Love this and think everyone interested in kbeauty should try it. Memebox I'm Lip Crayon x 2- I really like their lip crayons and have several. Memebox XO I'm Lip Tint- I'd like to try it! Memebox XO I'm Lip Liquid x 2- I'd like to try these too because I like their other lip products. Ettang Modeling Clay Take Out Cup Pack- I have this! Or had it, rather. Modeling clay packs are fun! Nooni Snowflake Cleanser- This appears to be made by Memebox Korea and it's for sale on TesterKorea, too. It says it's made by Cosmax, so I don't know what that means. It's a cleansing balm. Secret Key Lemon D-Toc Peeling Gel- Super popular and I haven't tried it. Dear by Enprani Moistful Booskin- I didn't really like this but mostly because I have something better. Freeset Donkey Milk 3D Moisture Cream- I need to try something donkey besides the May Island masks (which I love). This vault is SO tempting to me. This is actually what I would consider to be an excellent box with both popular and effective products in it! You want cult favorites? This is the box for you. The only thing new to me would be the Dr. Jart masks. I haven't tried those but it looks like I need to. I don't know if I'll be able to resist this. There is just so much in it that I like already or have been wanting to try. These go on sale the 26th and are first come, first serve. This is the link I think you'll be able to find them at. I bookmarked it anyway, hoping. Make SURE you use coupons when you can!! There's been no word that you can't use coupons on the Black Friday deals so check the Memebox Deals before you check out!! Coupons won't work on Black Friday Deals but if you have anything else in your cart, you should still try to use one. - BOGO Event: We will have a category of SELECT skincare and makeup items, including some of our favorite sheet masks. - DOORBUSTERS EVENT: Event will run for 4 days.